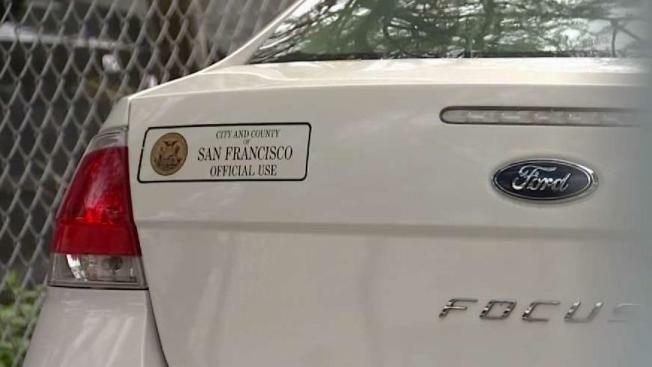 An audit shows that more than half the money spent on take-home vehicles for San Francisco officials is not authorized under the city administrative code. NBC Bay Area’s Investigative Unit obtained the findings of the Supervisors’ Budget Legislative Analyst, which critics say is evidence that the city’s take-home vehicle program is out of control, and that taxpayers are picking up the bill. City-owned vehicles are used every day by managers across 14 city agencies in San Francisco, including the police department and sheriff’s office, the San Francisco Airport and Muni. Supervisor Sandra Fewer is troubled by the apparent lapses revealed in the report. "These are not just extra cars for you to drive around because you don’t want to take your own personal vehicle," she said. The report states that city-owned cars are available so that officials can respond to "any incident or emergency after hours." After surveying 14 city agencies, the analyst found that more than half the vehicles, 134 out of 247, are not officially sanctioned by San Francisco’s city administrative code. The code specifies how many cars certain agencies are allowed to have. But some agencies have cars even though they’re not officially authorized. San Francisco International Airport, for example, has no vehicles allocated but uses 40 of them. Muni has 23 unauthorized vehicles. Fewer wants to know why the airport communications and marketing director needs a take-home car, as well as a Muni manager who oversees parking enforcement for periodic special events. "Are they really needed? Who gets to use them? Do they actually get to take them home?" she asked. Fewer is calling for a hearing of the budget committee she chairs to get answers. "We’ve heard stories of people saying, you know 'I’ve seen people in city cars delivering groceries into their own home,'" she said, adding: "Those kind of abuses, we want to get to the bottom of." The total cost to the city in gas, insurance and maintenance is nearly $1.6 million. Although city code doesn’t authorize Muni having any take-home vehicles, spokesman Paul Rose says transit professionals need them. "If something goes wrong in a system, during a special event, during the regular workday or night, they will be able to respond in moment’s notice to get those problems fixed," Rose said. For its part, the airport told the budget analyst that its marketing director is among a group of managers who have cars so that they can respond quickly to emergencies. Fewer plans to call for a hearing on the issue as soon as next week. "We are looking for waste in our budget all the time, and as the chair of the budget committee this year, I’m looking at waste, and this is one of the things I’m looking at," she said. City-owned vehicles are used every day by managers across 14 city agencies in San Francisco, including the Police and Sheriff’s Department, the San Francisco Airport and Muni. Supervisor Sandra Fewer is troubled by the apparent lapses revealed in the report. “These are not just extra cars for you to drive around because you don’t want to take your own personal vehicle,” she said. The reports states that city-owned cars are available so that officials can respond to “any incident or emergency after hours.” After surveying 14 city agencies, the analyst found that more than half the vehicles, 134 out of 247, are not officially sanctioned by San Francisco’s city administrative code. The code specifies how many cars certain agencies are allowed to have. But some agencies have cars even though they’re not officially authorized. SFO airport, for example, has no vehicles allocated, but uses 40 of them. Muni has 23 unauthorized vehicles. Supervisor Fewer wants to know why the airport communications and marketing director needs a take-home car, as well as a Muni manager who oversees parking enforcement for periodic special events. “Are they really needed? Who gets to use them? Do they actually get to take them home?” she asked. Supervisor Fewer plans to call for a hearing on all this as soon as next week.